If you are new to Wing Chun Kung Fu and looking for the best way to learn the system, then this is it! You have found your new Wing Chun School! If you are a current Wing Chun practitioner, then you will love the in-depth instruction given there that will help round out your knowledge! This is it - the entire system. All books, workshops, pro tips, quizzes, workouts, and more - organized step by step in the best way for you to learn quickly. The entire Level 1 Program. All Level 1 videos, books, seminars, workshops, quizzes, and new releases to keep you updated. The entire Level 2 Program. All Level 2 videos, books, seminars, workshops, quizzes, and new releases to keep you updated. The entire Level 3 Program. All Level 3 videos, books, seminars, workshops, quizzes, and new releases to keep you updated. Here you can read some of Wing Chun Illustrated's review of individual WCU lessons. (Note: these 3rd party reviews were for the individual downloads, not the entire course as presented here, but they will give you additional input into the included videos). Our Premiere Sifu is Wayne Belonoha. 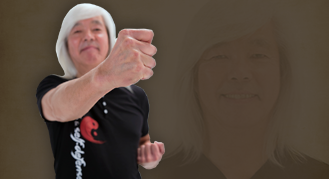 Wayne's course teaches you the complete Moy Yat/Sunny Tang Ving Tsun system. This is the most in-depth curriculum ever put on video. 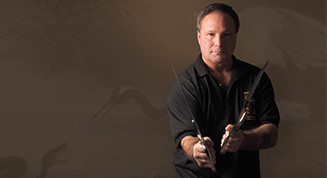 Wayne Belonoha is internationally recognized as a seasoned and sought after Ving Tsun instructor. He has been involved in numerous performances, television appearances, demonstrations, interviews and published articles, including performances for Queen Elizabeth and the grand opening of the Ip Man Hall, Foshan, China. The U.S. Citizenship and Immigration Services has recognized Wayne as an individual with extraordinary ability and has authorized an EB1 permanent resident visa (green card). Wayne runs the Atlanta and Canada branches of his school Wai's Kung Fu. He is a multiple gold medalist at national and international level competitions. Sifu Wayne is well known for his Wing Chun Compendium series of books, which are widely recognized as the modern text-books on Ving Tsun. Organizer and judge, and senior official national and international Kung Fu competitions. Accomplished professional instructor and speaker. Wayne Belonoha knows how to teach – with a professional background in the corporate world delivering project management education, Wayne has honed all the skills that make for a successful, informative, and enjoyable learning experience. Sifu Belonoha has also released a 9 disk Blu-Ray disk course that also covers the 108 steps in the system as it is taught in his schools! We feel it is the highest quality Ving Tsun video set ever made - and we've seen over 700 Wing Chun DVDs! (And the entire contents of those disks ARE INCLUDED in his Teachable Course). If you demand high-quality video and instruction, there is simply no other choice for a teacher. Hi, I'm Sifu Wayne Belonoha - welcome to the online presentation of my program. It's the same one I teach in my Wai's Kung Fu schools. I'm a certified instructor, lineage representative, author, and hall of fame inductee who has been training martial arts for over 40 years. I also have a professional background in course development and teaching methodologies. I took the entire Ving Tsun system, exactly as I was taught, and codified it so I could bring you a 108 step program that's simple to follow. I will guide you through the system so you can experience authentic Ving Tsun (Wing Chun) kung fu at your own pace. Professionally produced lessons plans including SMART objectives, onscreen tips, flyins, reminders, quotes, idioms & maxims, homework, drills, and more. I do not teach you everything I know. Not only would you have to binge-watch for 5 entire years, but to teach at such a granular level would actually degrade your learning. This course teaches very fine details - more than other courses - but stops short of spoon feeding the lesson. I leave room for you to engage your own sense of wonderment and discovery because the lessons learned from personal experience are the most valuable. I don't want you to miss out on those lessons, nor to miss learning how to learn. I seek the balance between giving you too much and giving you not enough. I want to supply absolutely everything you need to grow a flower, without just giving you a flower. My program is not just a collection of information to be collected, nor is it purely entertainment or just "techniques" to beat up an opponent, it's a strategically designed experience to help you learn and improve valuable and long-lasting professional-level skills. Thanks for considering my course. I look forward to being part of your journey. "The best and highest-quality martial arts videos on the market as well as the most complete Ip Man/Moy Yat system videos. Sifu Belohona is fantastic - you will really learn a lot and enjoy doing so!" Your teacher/Sifu for the WingTchunDo Course will be Sifu Fernandez - an experienced instructor, renowned bouncer and body guard. His street fighting experience has helped him formulate and further evolve his studies in combat and martial arts - bringing you the best experience and knowledge he has to offer. He began training Wing Chun in 1972 under the lineage of Chu Shong Tin (Ip Man -> Chu Shong Tin -> Jim Fung -> Sifu Fernandez) and has mastered the WingTsun system as a private student of Grandmaster Leung Ting (Ip Man -> Leung Ting -> Sifu Fernandez). In addition, Fernandez also excelled in other arts such as boxing, kick boxing, Greco-Roman wrestling, Doce Pares, Filipino escrima and various lineages of Wing Chun Kung Fu. These WCU lessons are very precise and informative. Sifu Fernandez gives you detailed and realistic views on Wing Chun as an art and as a street fighting system. He breaks away from many myths, taboos and hocus pocus misinformation found in the art today. His broad-minded view on many fighting systems shows in the evolution of classical Wing Chun to WingTchunDo (which is a global application of the Wing Chun and Wing Tsun systems). WingTchunDo was officially founded in 2005. Download Sifu Fernandez’s WingTchunDo Course Introduction and Grading PDF here for more info on this course. WingTchunDo™ is the martial art system formulated from the training and fight experience of Sifu Fernandez. This is based on the WingTsun™ system, created by Grandmaster Ip Man’s penultimate private student, GM Leung Ting, as well as the teachings of Ip Man’s third disciple, GM Chu Shing Tin and the Ip Chun lineage via Felix Leong. This is the most in-depth look at the WingTsun (Wing Chun) system ever put on video. The WingTsun™ System is from the Yip Man lineage passed down to Leung Ting. It is the most practiced version of Wing Chun in the world – yet the higher levels are kept secret and students are charged tens of thousands of dollars to learn them. It is not uncommon for a Sifu, like Master Fernandez, to have spend over $150,000 acquiring this knowledge. Now, for the first time ever, this system (and all of its secrets) is taught openly to the public. This includes the famous Butterfly Swords and Long Pole (acquired from 2 lineages and blended wonderfully together) – which have never been shown on video or taught publicly before. Sifu Fernandez started his studies under Grandmaster Chu Shong Tin’s student Jim Fung in 1972. He was at the time the youngest student to ever learn Wing Chun in Australia. (Chu Shong Tin is Ip Man’s 3rd disciple). He later studied under various Sifus of the Leung Ting lineage (learning the westernized versions of the system), and then under Grandmaster Leung Ting himself (learning the Chinese versions of the system) (Leung Ting was also a private student of Ip Man – about the 15th one more or less). Master Fernandez has also worked security for over 20 years, including body-guarding Grandmaster Ting himself. He has had hundreds of documented fights from his work, and many more “encounters” working security at clubs. He comes to you with 40 years in the martial arts, the knowledge of 2 complete Wing Chun systems, and a lot of real street-fighting experience – and with the pure intention of teaching you everything he knows. 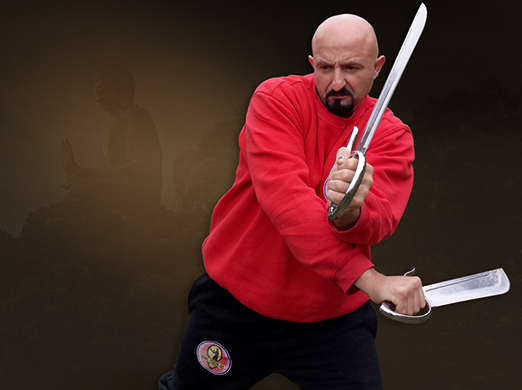 WingTchunDo is Sifu Fernandez’s evolution of the WingTsun/Wing Chun system. You will learn the Chinese version, the Westernized version, and Sifu Fernandez’s evolution of the system to encompass modern fighting systems and teaching you how to adapt and use your Wing Chun in every situation possible. Finally, the complete WingTsun & WingTchunDo systems in full detail! With WCU’s WingTchunDo course you will learn all the training methodology and secrets of Wing Chun (WingTsun) Kung Fu – There are absolutely no secrets are held back! You will learn the whole system from beginning to the end – everything is explained, including the smallest detail, leaving nothing to chance. Students have been blown away by the sheer volume of instruction given by Sifu Fernandez – calling his course “the largest and most detailed martial art video course on the planet”. Sifu Fernandez is a recognized master with over 40 years in the martial arts and 20 years experience as a bouncer and bodyguard. He has put together for you the largest and most complete video course ever created (over 75 hours of instruction when initially released)… and that is not including all of the updates he adds to the course as it evolves and is refined by the global interaction of his students and teachers. His aim is to not only teach you the complete system, but to give you the most realistic view possible on “real combat street defense”. This Wing Chun University course is academically certified by Sifu Fernandez and even gives you the chance to open your own school with the proper mastery! 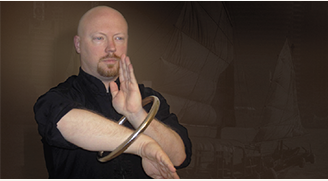 Sifu Tyler Rea is producing a series on the Wing Chun Rattan Rings. This is the most in-depth look at the Jook Wan system ever put on video. The Jook Wan Huen Bamboo Ring System is a product of the early years in the development of Wing Chun. Sifu Rea takes you through the foundations of this method that the Secret Societies used to evolve this system and train beginners easily and quickly in the essential structural elements necessary for skillful Wing Chun boxing. This is the most in-depth look at the Jook Wan system ever put on video. The Jook Wan Huen Bamboo Ring System is a product of the early years in the development of Wing Chun. Sifu Rea takes you through the foundations of this method that the Secret Societies used to evolve Wing Chun and train beginners easily and quickly in the essential structural elements necessary for skillful Wing Chun boxing. Historians believe members of the nineteenth-century group called the Red Boat Opera Company (aka the Red Flower Union and the Plum Blossom Opera) used the bamboo ring as a means of training the emerging style of Wing Chun Kung Fu under the guise of a dramatic performance implement. In addition, when training on board their boats, the Red Junk members would often practice the ring methods in a seated position due to congestion on board, rough waters, or slippery decks. While not filmed in a studio, these HD videos are very good quality and cover the foundations/fundamentals of the system. The rotational Ging power you can develop from the rings is immense and it is worthy of attention from all practitioners of the art. In addition, the Jook Wan system is one of the finest and quickest methods of acquiring certain kinds of Ging and structure within Wing Chun prior to or in combination with studying the forms. These videos are not to be missed! If you need rings, you can grab some at Everything Wing Chun. The 10″ steel ring is best for most people. "…some consider the practice of the Jook Wan Huen to be the final level of refinement in Wing Chun…"
In the early 1950's Duncan Leung was introduced to Wing Chun by his friend and classmate Bruce Lee. Both Duncan and Bruce learned Wing Chun in the same class under Yip Man for a couple of years, when one day Duncan came up to Yip Man and told him he was thinking of quitting the class. When Yip Man asked him why, Duncan replied, we are always learning the same old stuff....is that all there is? Yip Man looked at Duncan and said, "Do you have 300 dollars a month"? Duncan asked, "why"? "Because that's what it would cost for me to teach you Wing Chun", replied Yip Man. This is not an offer that Yip Man made to just anyone. First, not many people could afford that kind of money. By way of comparison, all of the other classmates were paying Yip Man only 8HKD a month for class (including Bruce Lee and many other now-famous sifus) - 300/mo was 37.5 times more than anyone else was paying! Back then 300 Hong Kong dollars was equivalent to a police detectives monthly salary, but Duncan came from a wealthy family and his mother was able and willing to pay that amount to keep her son occupied and out of trouble. But also Yip Man saw something in Duncan that inspired him to want to teach him not just Wing Chun, but how to fight with it and apply it. So from that time on between 1955-59 Duncan never trained in the regular class. He trained privately with Yip Man and had his undivided attention. It was during that time he fully mastered the system and its application. Yip Man forced Duncan to fight in order to learn how to use the techniques and he is a veteran of literally hundreds and hundreds of savage fights. He earned the nickname of the Wing Chun Warrior and it is doubtful that any other student of Yip Man has as much fighting experience as Sifu Duncan Leung - even famed fighter Wong Shun Leung. Larry Saccoia started learning Wing Chun from Duncan Leung in 1977 while he was stationed in Norfolk, Virginia serving in the U. S. Navy. During those days the students in Duncan's class trained no less than 4 hours a day 6 days a week and the training was so brutal that only the most dedicated of students survived more than a year. By 1981 in just 4 short years Larry became the most skilled student in the school and was acting as Sifu Leung's assistant instructor until 1985 when his wife, who then was his fiancée was accepted to Medical School in Richmond, Virginia to study dentistry. Larry moved to Richmond to be close to her and he opened his own Kung Fu studio and remained in Richmond teaching until his wife graduated from dental school. In 1991 he and his wife returned to Virginia Beach and it was at that time he formally became a Disciple of Sifu Duncan Leung and he continued to teach and run the Virginia Beach School until Sifu Leung formally retired from teaching in 2002. Like Duncan, Larry also learned the application of Wing Chun through the school of hard knocks being a veteran of countless fights where the blood on his clothes was never his. Today Larry continues to teach Applied Wing Chun privately in Chesapeake Virginia and has over 37 years of experience. He has spent more continuous time learning from and teaching alongside Sifu Duncan Leung than any other person in the world; and as such is uniquely qualified to teach Applied Wing Chun Kung Fu. Why should you invest your time to watch these Applied Wing Chun Video lessons? After all, there are literally thousands of videos and books already on the subject of Wing Chun, and Grand Master Yip Man taught everyone the same things. So does the world really need another video lesson on this subject? Consider this. Yip Man did teach everyone the same techniques, but because everyone's understanding is not the same, there exists today many different interpretations of these applications and most importantly, different understandings of the principles that govern Wing Chun. The only true way to know for sure if your understanding of the principles and techniques of Wing Chun is correct is to ultimately APPLY it to PROVE it in combat. The lineage of Applied Wing Chun comes from Duncan Leung who was given the nickname of the "Wing Chun Warrior". He is a private disciple of Yip Man who had literally hundreds and hundreds of brutal fights while learning to apply his art. 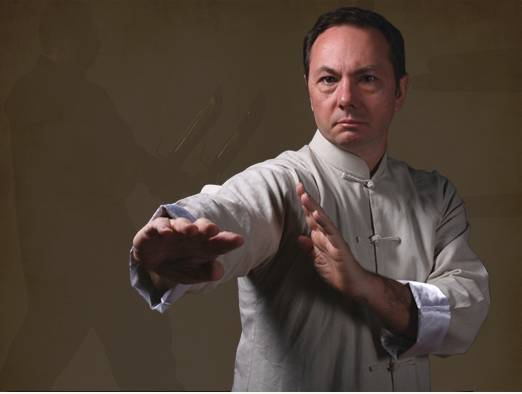 He has proven the principles and application of Wing Chun and has taught the same to many students, including the author of this video series, Larry Saccoia. Larry himself learned the application of Wing Chun through a countless number of fights. In these video lessons, Sifu Larry Saccoia explains and demonstrates these principles in a logical straight forward manner so they are easily understood. Understanding these principles as well as the correct way to train the techniques provides the foundation required to apply Wing Chun in a combat situation. These lessons are laid out in a chronological manner as to allow the student to build a solid foundation and move forward to advanced studies. Therefore, it is recommended that even if you have previous experience in Wing Chun, you should still start from the beginning of Lesson 1 and work your way through each of the lessons in order. The same principles you might already be familiar with are likely presented (and more importantly, trained) in a way that you may not be familiar with (but that you will come to appreciate). Born in Hong Kong and raised in San Francisco. Grandmaster Yau began studying the Ip (Yip) Man Wing Chun system in 1972 from his two uncles, Chris and Stanley Chan, both students of the Great Grandmaster Ip Man. Though GM Yau’s training was in the martial arts his natural temperament led him to question the value of studying violence as a means of solving problems. He came to realize that healing and helping others were areas that he was more interested in pursuing. He spent eight years working in an acupuncture clinic as an apprentice for Dr. John S. Yee Ph.D. from 1985 – 1992, learning Acupuncture, Herbs, and Qigong. From 1995 to 2002, GM Yau studied under Wing Pon learning Quantum Physics and helping co-create the Holon Method. He continued applying his Quantum and Theoretical Physics knowledge with Bill Gough of the Foundation for Mind-Being Research from 2000 to 2009. It is through all these methods that GM Yau developed his revolutionary system of body shaping, to help unleash the hidden power everyone has inside them. GM Yau was formerly the President and a Board Member of the Foundation for Mind-Being Research. Today his focus is on research & development of the Acupuncture and Energetic system for improving sports, fitness, martial arts, longevity and health fields. "...the most advanced training and conditioning short-cut methods to date..."
The secrets of Yi Zhi Keem Yueng Ma are reviled to help you get faster and more powerful fast. Never seen before modern training techniques are introduced to the public for the first time. Learn how to balance your head and connect your head to your body to work as one unit. Learn to how to focus your eyes, placement of your tongue and special breathing techniques. Learn to balance your shoulders, open your diaphragm and strengthen your core for endurance. Learn how to build a solid foundation using your spinal nerve system. Learn how to use body mechanics for extra power. Learn how to unite the body using your shoulder blades for a more solid foundation. Learn how to make a more powerful fist. Learn how to unite the body and arms by super stretching. Learn how to train internal awareness for effortless power. Learn how to connect your mind and body through focus, concentration and meditation. Learn how to strengthen your bone joints for total body connection. You will learn the secret Wing Chun muscle and tendon change exercises. This is the preparation for Muscle Tendon Change and Bone Marrow Strengthening exercises for advanced training. These video comes in both 720p and 1080p. You can play either, depending on your system and internet capabilities. For years people have called us up at Everything Wing Chun® and asked us what is the "best" DVD to buy for a beginner. That is always a loaded and complicated question because there are a lot of variables, but now we have a good answer for everyone: The Wing Chun University®! (WCU). It is better than any other DVD or any other online program (and we've watched over 700+ DVDs to know!). The Best Teachers - There are a lot of great Wing Chun instructors and a lot of crappy ones. You can rest assured the Sifus in the WCU are some of the best Wing Chun teachers in the world. Period. We want the WCU to be the new standard in instruction, and to that end, we only work with the best. High Quality Video - All the videos are presented in high-definition 720p or 1080p. In addition, the care with which some of the courses were made is remarkable. If you don't believe us check out Sifu Wayne Belonoha's course - he made that himself! It looks like a full studio production. And that savings created by doing the work ourselves is passed on to you. The Entire System is offered as full in-depth video immer­sion courses presented in individual lessons and steps. You will learn the entire framework for the lineage/system of Wing Chun you are studying, along with as much detail as is possible to relate over video. You also have the opportunity to contact your Sifu and ask questions, get videos reviews, or meet in person to further your education. Curriculums, Courses, Levels, Lessons/Steps - Because we work with the best teachers you get the benefit of having a highly-tuned curriculum presented to you. We want to take you, the new student, and teach you step-by-step how to become a master; and to do so with multiple Wing Chun lineages. It is this step-by-step, lesson-by-lesson approach that sets us apart, among other things. To our knowledge we are the first to ever offer this kind of approach to training outside the classroom. If you follow the step-by-step timetable for mastery you will learn the entire system over 2 years. If you just watch the videos alone, the same course will take 28-90+ straight hours, so the pace is yours to set. Yes, that is right, some courses are over 90 hours long! These are the most extensive training courses ever put on video! Sound good? - You should check it out by browsing our courses. You might start off with a free intro video, the free previews, or just jump right in and select the topic that you want to learn more about. We hope you enjoy the WCU, a lot of hard work went into bringing it to you! Your support will translate directly into many new courses and features over the coming years. Watch the HD video lessons. They are optimized to help you learn Wing Chun as well as possible. Train and practice at home. Study the comments and practice some more! Repeat for each lesson you would like feedback on. Learn the entire Wing Chun system from multiple teachers. Detailed video feedback from your Sifu. Well structured and detailed for the beginner. Advanced students - you will improve your understanding. Schools/Sifus can get ideas from the highly tuned curriculums. Instant delivery - Start immediately. Watch anytime you want. Save a ton of money - No shipping, customs, or VAT. Perfect Playback - No more worrying about scratched or unplayable DVDs. Watch from anywhere - Apps for mobile devices as well as free streaming for life. Do you want to download the videos instead, and own them outright? We do not offer this on this site, but we do on others. So you have a couple options. 2) You can buy downloadable versions of all the videos we offer on our PlatformPurple store. You will still need the use an application to download and view them, but they will be yours for life. The downside is that you miss out on the interaction with the Sifus (Note: this primarily applies to Sifu Belonoha's course).